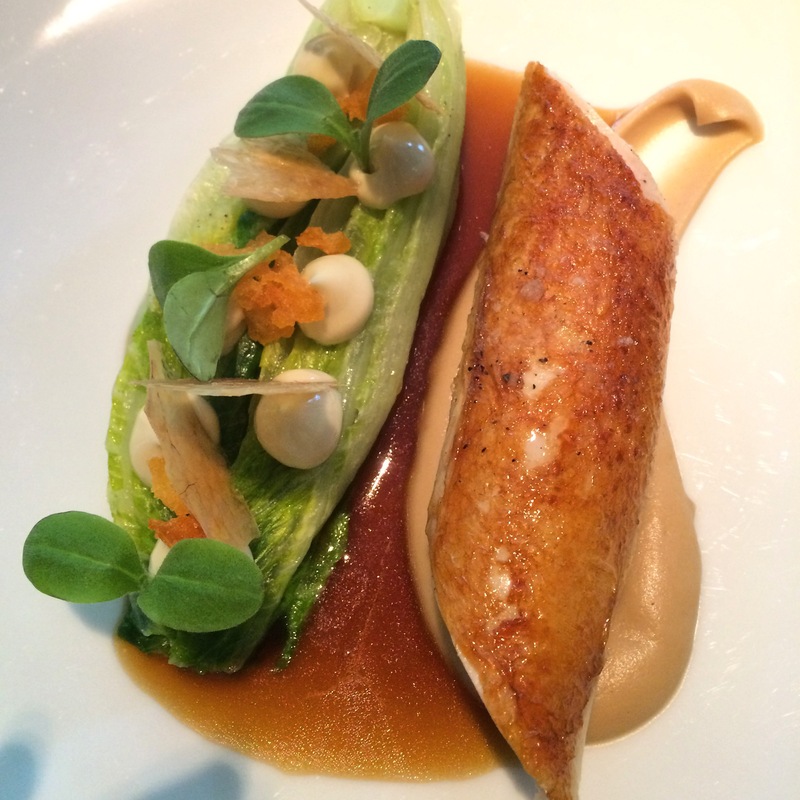 London is one of the top ranked cities in the world for fine dining, holding over 70 Michelin stars, so it comes as no surprise that the standard of food in this wonderful city is outstanding. But you don’t have to sell a lung to afford the best grub in London, there are plenty of great restaurants, cafés, street food stalls and markets to get you salivating. 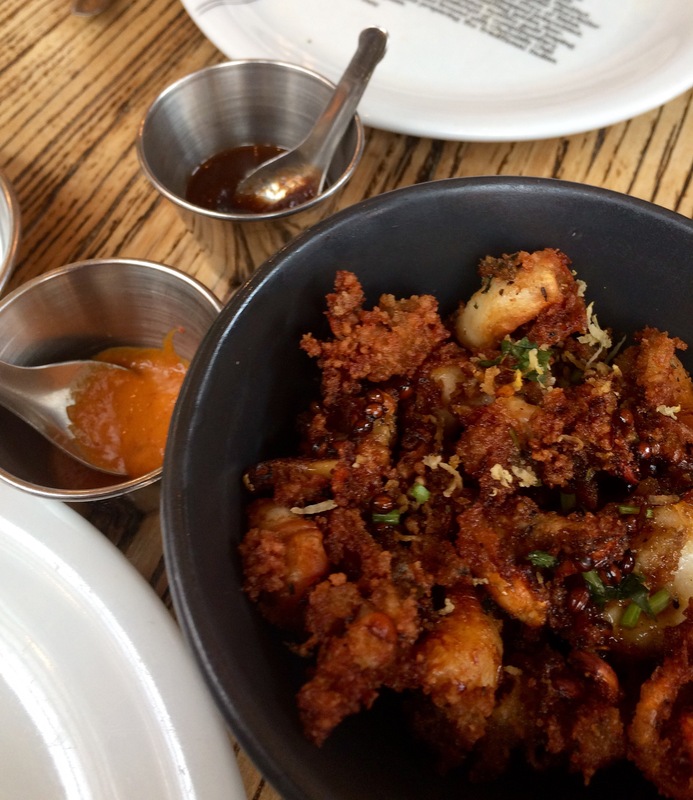 So, if you’re in the nation’s capital with the intention of loosening your belts and settling in for a few days of top-nosh, let me share with you some amazing restaurants and the best street food you will ever encounter. First things first, start your day at the botanical paradise of the Bourne and Hollingsworth Buildings Restaurant (the B&H to locals). Hallelujah to Pinterest for this amazing find – a holiday for the eyes as well as the taste buds. 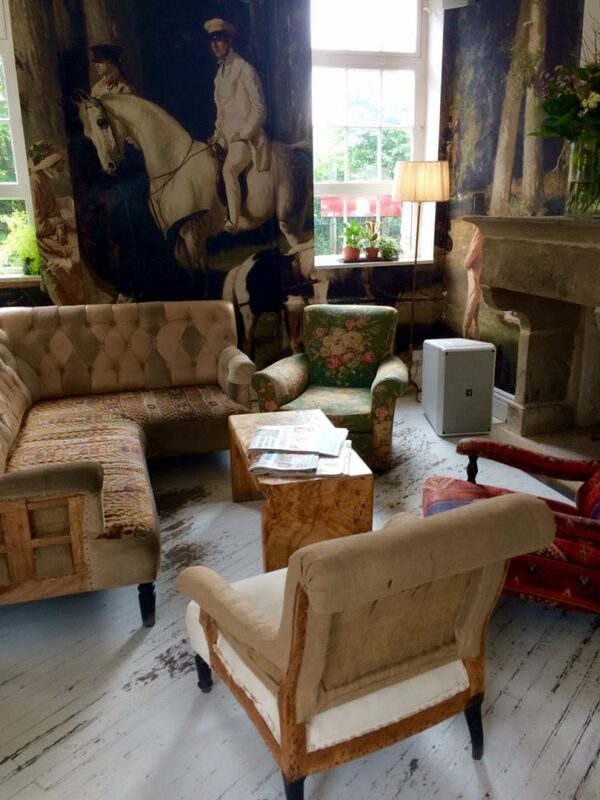 Like some wealthy old country estate which has gone to seed you can take your tea in the garden room amongst the flora or find a comfy low arm-chair with worn blooming prints in the cosy restaurant area. Such a beautiful restaurant, a perfect setting for breakfast, and bustling with cheeriness from the attentive staff and happy punters alike. The menu for brunch is fairly substantial and all impecably prepared. Booking is essential, this kind of high quality food in pretty surroundings is always going to be a winner with locals and visitors alike. Find more information on their website. So, how do you like your eggs? 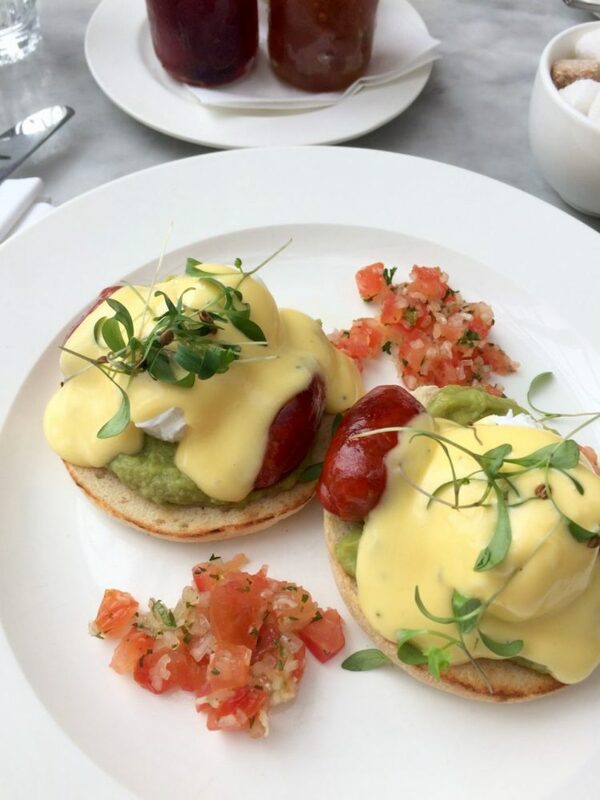 Alternatively, if you prefer swank over crittal conservatory’s, check out one of the four Granger & Co.’s in Notting Hill, Kings Cross, Clerkenwell and Chelsea as another top choice for brunch in London. Street food in London wonderfully represents the enormous diversity of cultures you find yourself rubbing shoulders with in this liquorice allsorts of a metropolis. Cuisines from countries you’ve never even heard of and dishes that you can’t even pronounce. That said – you don’t need to speak Uzbekistanian to eat Uzbekistanian. Most people have heard of Greenwich, Camden or Borough Markets, in fact, most people have been, but don’t forget the little guys. Leather Lane has been around 400 years and has a royal history – the wager of a bad debt made by destitute King Charles II. Enveloped by Little Italy and once a place for artists and instrument makers, these days you will be spoilt for choice when you come for lunch. Or Broadway Market, rumoured to have inspired the set of Eastenders, is a foodie-heaven frequented by local hipsters and fashionista’s. Or Berwick Street Market – just around the corner from Oxford Circus, you’re bound to be passing at some point so take a left turn and pick up some tasty morsels. Street food is becoming a lot more sophisticated but ultimately offers you the opportunity to sample some unusual dishes and unique flavours – my particular favourite are the sea urchins on Borough Market. Well obviously I would direct you to Brick Lane in Shoreditch if it’s a traditional Indian restaurant you’re hankering after – a good curry and naan with a pinch of bad-attitude waiters and a parting after-eight as standard, and I know you won’t be disappointed. This is the area where Bangladeshi’s immigrated to last century and brought their curry recipes with them so if it’s authentic Indian you’re after, Brick Lane is where you need to be for the most amazing curries. However, there is an alternative option – curry with a twist, if you like – that will also blow your socks off : Dishoom. Dishoom is a modern take on the old Iranian cafe’s of Bombay. Not many exist still today, but back when Iranian’s escaped persecution in their own land, they crossed borders and Bombay in particular became home to these peculiar Irani-style cafe’s where both lawyer and lay person ate their meals together. It really doesn’t get much better than Dishoom. From the minute you enter one of their establishment in Covent Garden, Shoreditch or Kensington your nose sends out party invites to various other body members seducing you with scents of cardamom and clove, cassia and cumin. The welcome is warm and the jovial atmosphere in very well groomed surroundings makes it the perfect spot to enjoy an evening with friends – I can’t recommend it highly enough! The calamari small plate and the Chicken Ruby, mopped up with a Roomali Roti won’t disappoint. Wash it down with a mango and fennel seed lassi and jobs a good’un. Reservations are taken for breakfast and lunch, but if there are less than 6 of you at Dinner you can’t book and may have to wait a short while. Get their opening times on their website. If you’re hankering for a picnic but feel like cheese and ham sandwiches just don’t make the grain then find yourselves an Ottolenghi Deli and pick up some of their amazing salads and even more amazing cakes and pastries. As if they didn’t look good enough anyway, they’re even healthy too, it’s pure clean eating – although maybe not all the cakes. There are 6 establishments across London, including Belgravia, Islington and Spitalfields, to purchase your posh picnic. So, I’ve shared some London food gems with you my friends, and all places I wouldn’t hesitate to take my most critical of foodie-friends (who shall remain nameless, but you know the type – never compliment your cooking, always name-drop their latest extravagant nosh-up, call the chefs by their Christian names). Well, if you need a retort then book yourselves a table at Heston’s at the Mandarin Oriental in Knightsbridge. ‘Dinner‘ ranks number 7 in the Worlds Best Restaurants this year and it’s really easy to see why. The menu is inspired by the History of British cuisine – contemporary takes on old recipes which show that our obsession with food is not just a modern marvel. Every mouthful will leave you humming with delight and wonderment at how something can taste so good, and that’s just the bread they bring you to nibble on as you wait on the ultimate dining experience! You may well be surrounded by rich Chinese business men and their bag-laiden teenage daughters, only here to pick up their new horse-hair Manolos, but Dinner doesn’t request that you own half a football club. Of course it’s high-end and you probably want to dress up but the staff are gracious and don’t differentiate, there are still many diners there for special occasions who wouldn’t ordinarily be so lavish and this is much respected. A 3 course lunch from their set lunch menu costs £40 (available Monday – Friday) and the á la carte considerably more, but I promise you it’s worth every penny. This is the seventh best restaurant in the world! In the middle of Marylebone is the cosiest of gastro-pubs. Renowned for its amazing full English breakfast, after you’ve spent the evening in one of their contemporary styled rooms. So if you like to stay in acommodation with an excellent restaurant for your evening meal then you will not be disappointed with The Grazing Goat : a British menu with all the local favourites and classic meals. The rooms are cosy and welcoming, as are the staff – the perfect place to chill out after a busy day in this foodie city. So go on, book your London foodie break and don’t forget to drop me a comment, have you eaten anywhere great in London? Got a favourite London food market? I’d love to know! Have you seen the Coppa Club Igloos on Instagram yet? Check out TaylorHeartsTravel’s post here – now that’s what you call a premium spot for dinner! Also, have you subscribed to my blog yet? Leave your email below in the subscribe box and I will send you a message every time a new post comes out. No spam, I promise! And be sure to check out my instagram for more travelicious inspiration! Off to book a meal at ‘Dinner’ the food looks amazing! Some fabulous places – will definitely check out some of these options for my next London visit! It WAS amazing! You should! I’m definitely pinning this post for later reference – we’re starting to plan a weekend in London and your post left my mouth watering, Alex. I really enjoy reading your posts. Keep up the good work! I love all the options in London! I feel like I haven’t even scratched the surface of all the great restaurants and places to eat – bookmarking this for our future trips back! My mouth is watering after reading this post (not fair, I am about to go to bed). I am attracted to cities with good food. Sadly, my experience with food in London wasn’t great when I visited for the first time. But, that was long time ago and seems like things have changed. I can spend days exploring the markets (that is one of my favorite things to do on my travels). London has some great markets so I hope you have a better experience next time! Love this post! I need to check some of these out. I have heard so much about Dishoom and never made it there but it looks SO good in your photos I’m going to have to rectify that soon! Pinned this for later, I’m sure I’ll reference it next time I’m looking for food in London. Dishonest was cool – smelled like they’d ground every single spice the moment you walked in. Oh my goodness now I’m starving and I just ate! Haha! I’m visiting London next year so I’m definitely saving this! Thank you so much for joining #FlyAwayFriday, see you in 2 weeks! I know – I was salivating writing it! Enjoy London! 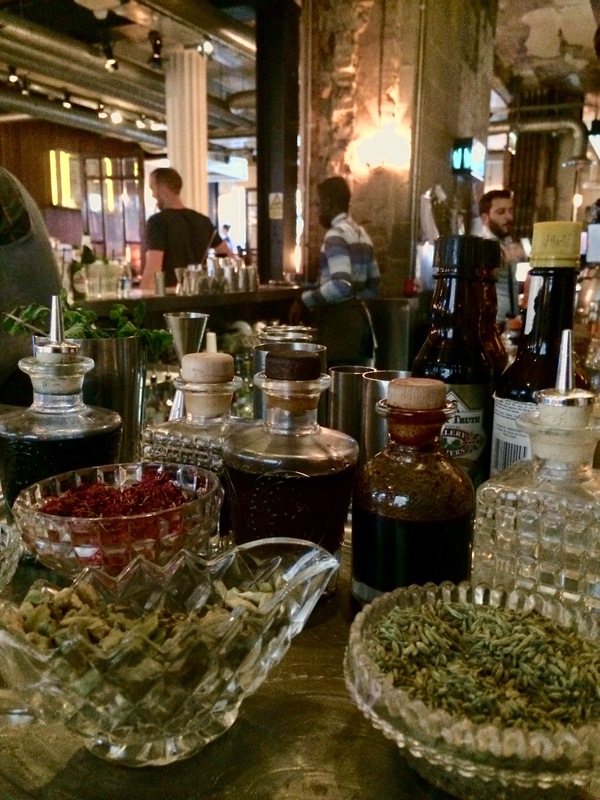 Amazing options and a fabulous feast of a review, as always…’From the minute you enter their establishment in Shoreditch your nose sends out party invites to various other body members seducing you with scents of cardamom and clove, cassia and cumin’ Is my favourite line. Have Pinned and shared! I didn’t used to be a foodie person but maybe with age I am appreciating good nosh far more. 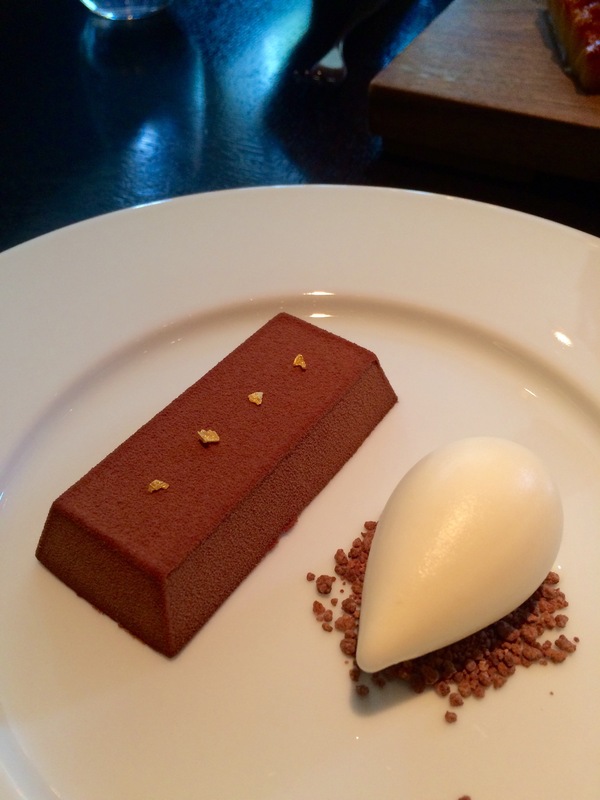 £40 for a set lunch at Dinner (that’s an oxymoron if ever there was!) sounds excellent value. Love a good curry too so will make a note. Thats what I thought, and for 2 star Michelin food too! Definitely worth it! Yum! I’ve lived in (or near) London since 2007 and you had me salivating at your choices. I will definitely be checking some of these out in the near future. Lucky you – having all that London-ness on your doorstep! wow – I don’t meet many who say they have never been to London, it certainly is a wonderful city! Ugh this looks so amazing!! Esp the brunch and dessert dishes haha!! They look deiicious! Thank you for sharing on FlyAwayFriday! That brunch was to die for! Aw that’s a shame, yes we couldn’t fault it. You’re very lucky having all that awesome food on your doorstep! The lemon & polenta drizzle cake I had was amazing!! Hope so – its such a great city! I’m hungry thinking about it! What a great post and thanks for the ideas, as I live in London. I will definitely be trying a few of these out sooner rather than later. Beautiful pictures too. Thanks Mel. The markets are great! Oh the lemon and polenta drizzle!!! You’ve made me very hungry reading all this. Some really good places you’ve detailed – a couple I have yet to try but you are right, Dinner is worth it – so delicious. We went for lunch on a weekday which was pretty good value for the quality. I used to live up the road from Ottolenghi. It was a bit pricey to go there loads but his cook book is very good so can do it at home! His new restaurant NOPI is excellent too. Thanks for linking to #citytripping I need to book a date night! Didn’t know you liked me that much ? #datenight! The guy who told me about Ottolenghi also told me about his recipe book – I must get it. Quite envious if you living in London. Thanks for putting together such a great guide! I’ll definitely be visiting the restaurants and markets you’ve mentioned for our trip across the pond next summer. I can’t wait to try the Indian food there which everyone says is great. It is but some Indian restaurants are also awful too so make sure you go with a recommendation! Oo I shall try that next time I’m there! Oo really, no we haven’t. I’ve always wanted a good recommendation for Italian! Thanks! Ar thanks – glad you enjoyed! 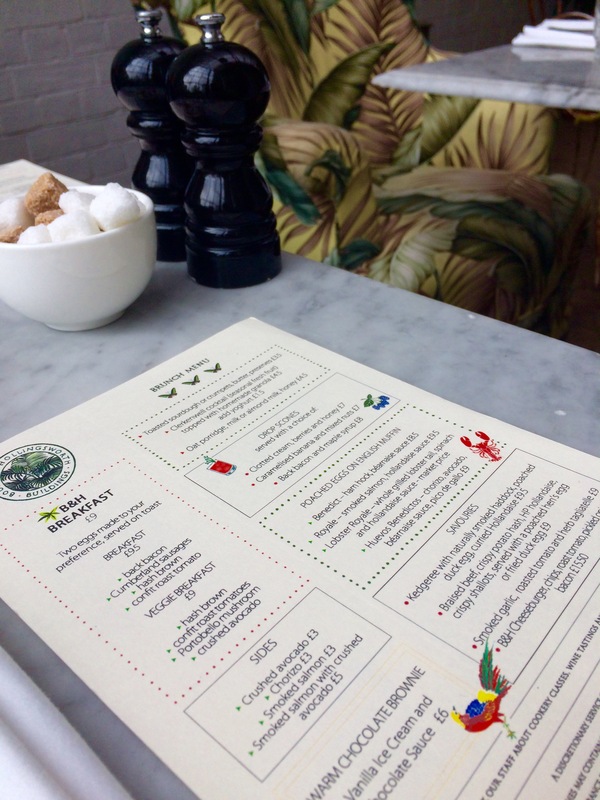 You must have brunch in the Bourne & Hollingsworth buildings – it’s amazing! Oh wow… Your photographs are simply stunning. Everything looks so scrumptious! My husband and I will be meeting a tax colleague in London in April and I just never thought much about food choices. I will need to brush up on the delicacies London has to offer. I usually take some snacks along with me when we go to a new place, just in case. Thanks for sharing your choices with all of us on pinterest. Ar, hope you have lots of fun in April. And thanks! I am so pleased to find this article! These seem great places! I want to try these places. Thanks a lot for the great article. Enjoy eating your way around London – it’s a great foodie city!